Welcome to our independent Garmin Forerunner 630 review. Are you an experienced runner looking for an advanced running watch? Or perhaps you simply want the latest and most advanced wearable tech on your wrist? 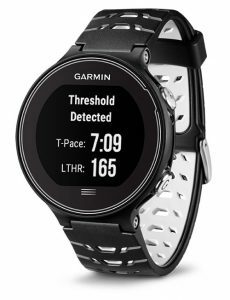 Garmin Forerunner 630 is an advanced GPS running watch with may features which will help train and develop your running form. These include advanced running dynamics to track your body movement during a training session. To get these advanced metrics an HRM-run chest strap is required. Unfortunately, the 630 does not have a wrist heart rate monitor, however this should not put you off if you are looking for accurate heart rate readings. This watch packs in all the features of the previous 620 and then some. You may already be familiar with the Garmin Forerunner 235 which has an optical wrist based heart rate monitor. If you were expecting the 630 to have one of these you’d be very much mistaken. Forerunner 630 uses the latest HRM-Run chest strap to measure heart rate but it doesn’t stop at just heart rate. Garmin Forerunner 630 has all the advanced features to measure your running. Pairing with the HRM-Run will give you advanced running dynamics: ground contact time balance, vertical ratio, and real-time stride length. Pair your compatible Garmin Forerunner 630 with the HRM-Run to get your heart rate and real-time feedback about your running form. Many modern running watches look exactly that – a brightly colored sport watch to match your fluorescent clothing. See the earlier Forerunner 15 or 25 for evidence of this. These watches are cheaper but aren’t exactly fashion statements. This time Garmin have designed a running watch which you won’t mind wearing all day. The colours are dark (Blue or Black) and formed in a matte plastic that still retains a sport look. The wrist strap is comfortable to wear all day and has small holes to help with ventilation when things get sweaty. Garmin have increased the watch face to an impressive 1.23” colour touchscreen. It’s easy to swipe and navigate through the range of impressive data fields on offer. The display isn’t as bright as some on the market but is adequate at night when using the backlight. Display resolution is slightly on the low side (215 x 180 pixels) compared with the Apple watch. The watch also has 4 buttons, 2 either side of the display which are marked with their features. The display also has a large touchscreen button to help you scroll through the menu. Forerunner 630 has improved battery life over the earlier 620. 12 weeks in watch mode and 17 hours in training mode, so you can easily fit in several runs before charging. To charge the 630 simply connect via the charging cradle that it clips into. Charge either via USB or mains. Garmin haven’t yet mastered a universal charging cable and each one is different per Forerunner model. Forerunner 630 can be used for swimming and cycling but the features are limited for these activities. You’re better off buying the Forerunner 920XT for multi-sports or triathlon training. 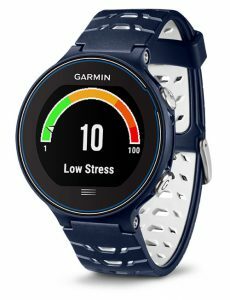 This watch comes with all the standard features you’d expect in an advanced running watch; speed, distance, pace, VO2 Max estimates (volume of oxygen used during activity), recovery time and race predictions. Realise the cost of moving forward towards your destination. A low score indicates a small cost or “bounce” for a large stride length. Determine if an increase in fatigue is occurring or imminent. To get the most benefit out of this metric, take the 3-minute test at roughly the same time every day under relatively similar conditions. Measure your balance during ground contact to discover if you are running symmetrically. Use Forerunner 630 with the HRM-Run chest strap to gain all the intelligence you need to improve your technique. Measure your Stride Length – the distance travelled horizontally towards your destination in real-time – and recognise its high correlation with pace. After your run, review this metric on Garmin Connect and see how your stride varies with cadence, elevation, or other metrics of interest. Use Ground Contact Balance to measure your balance during ground contact to discover if you are running symmetrically. Realise the cost of moving forward towards your destination through determining your Vertical Ratio percentage. A low score indicates a small cost or “bounce” for a large Stride Length. Forerunner 630 uses extended physiological metrics to help you get the most out of your workouts and feel confident with what you can accomplish when you toe the line. Once Forerunner 630 learns your lactate threshold estimate, you can apply it to your heart rate training when setting up zones. Overall training load, sleep, nutrition and general life stress play a role in how you will perform in a tough workout. Stay fully informed of the changes to your body as you move through or prepare for your run. Measure your Stress Score to determine if an increase in fatigue is occurring or imminent. To get the most benefit out of this metric, take the 3-minute test at roughly the same time every day under relatively similar conditions. Find out your Performance Condition through a real-time assessment of pace and heart rate variability. A score of +10 means you’re ready to take on your challenge and you can expect your run to feel good. Take away the guesswork and discover precisely how fast you should really be running with your Lactate Threshold. Understand exactly when your fatigue is likely to start increasing at an accelerating rate (for well trained runners, this threshold often occurs at roughly 90% of their maximum heart rate). All this data is worthless without accurate GPS. Thankfully the Forerunner 630 has GPS+GLONASS which has additional accuracy by using more satellites for a GPS fix. Long gone are the days of waiting around for your running to find satellites. You can also receive audio prompts from your connected smartphone that include laps and lap times for extra awareness. Garmin is fast becoming a leader in fitness activity tracking wearables. The recent vivofit and vivosmart are evidence of this. Garmin has a keen eye on Fitbit and looking to gain marketshare in this space. They are now integrating daily activity tracking into all of their wearables, including the Fenix 3 outdoor sport watch (a great looking piece of kit). Forerunner 630 doubles as a watch and activity tracker. It count steps, calories and distance throughout the day. The move bar with vibration alert motivates you to move when you’ve been sitting too long which is great motivation especially if you’re office based. Garmin Connect is the free fitness app that accompanies Forerunner 630 and is well known for being behind some of the competition. With many Garmin users turning to Strava to analyze their fitness data. Although the free Strava account is lacking in quality features unlike Garmin Connect. Used properly Garmin Connect can be a powerful training tool, with built-in training plans, custom courses and detailed reports on your training activity. Enter the newly redesigned Garmin Connect App (v3.0), now available on all smartphone platforms including Windows 10. The interface has been redesigned so the user can easily customise what’s important to them based on their activities and devices. For runners at glance you can easily swipe through your recent activities to get a break down of stats. 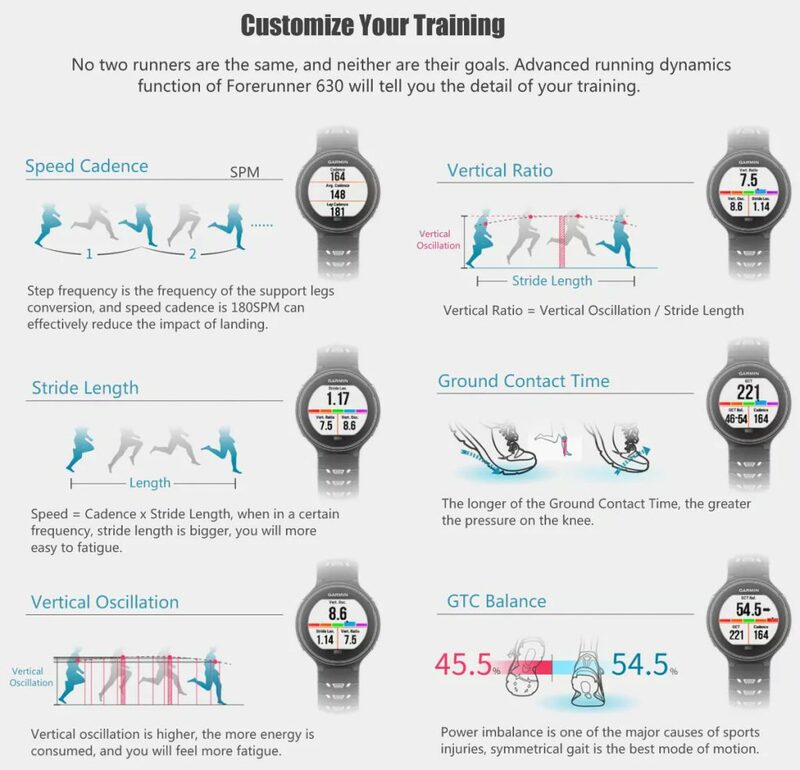 Pace, Speed, Timing, Heart Rate, Running Dynamics, Elevation and Temperature details are all summarised. Lap times with average pace also included. Colourful graphs are also highly detailed. See a complete picture of your activities. Connected devices allow instant uploads to the Garmin Connect Mobile app, so you can review and share your activities. If you’re keen on sharing your data there’s a clever feature called Live Track which you can share with friends via email or social media. This allows you to share your run in real-time by using your smartphone signal. Connections will be able to see your location on a map with details on pace, speed and heart rate. This handy feature is also good to notify connections if you’re on a long night time training run and when they can expect you home. The desktop version of Garmin Connect gives you many more features. Create your own workouts and courses by plotting on a map within the desktop app. You can then download these to your Forerunner and race against the clock. In summary Garmin Connect is one of the best free fitness apps available and is often not used to it’s full potential. Many reviews only focus on the mobile app but we highly recommend spending more time on the full desktop version. By learning how to make use of the advanced training features available you will improve your running form and fitness. Forerunner 630 comes with Bluetooth connectivity and wirelessly pairs with your compatible Bluetooth smartphone. To pair your phone with Garmin Connect download the app and swipe to devices. Make sure pairing is enabled on your Forerunner and Bluetooth is turned on, simply follow the onscreen instructions. When paired Forerunner 630 will display smart notifications on it’s display. These include e-mail, text, call and calendar alerts. Handy if you’re running with your phone strapped to your arm, once glance at your watch and you’ll know if you need to stop and take action. If it’s just the wife you can happily ignore and carry on your run. The Forerunner 630 watch face can also be customised through Connect IQ apps. This relatively new platform is Garmin’s equivalent of an app store, allowing developers to design their own apps, watch faces and widgets for capturing data. Connect IQ can be accessed either through your smartphone or via desktop. Your watch will need to be connected via USB charging clip to download from the desktop app. 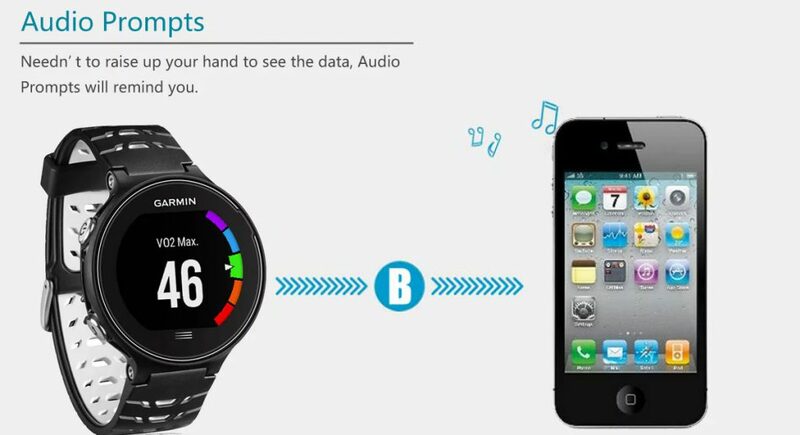 New Connect IQ apps are appearing every week and this really sets Garmin apart from some of it’s competitors. Forerunner 630 also comes with music controls and audio prompts, handy if you run with music playing from your phone. The Forerunner 630 is more expensive than the Fitbit Surge and TomTom Spark but it’s well worth spending the extra. 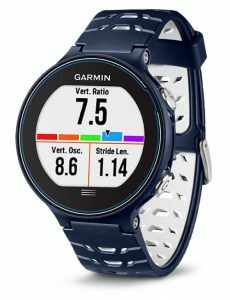 If you’re looking for the most advanced running features available in a GPS running watch then you can’t go wrong. 2nd Generation Running Dynamics and Extended Physiological Measurements will seriously aid your running and help you become a better runner. If you only need essential run data then the cheaper Forerunner 230 or 235 will suit your needs perfectly. A range of online retailers stock the Garmin Forerunner 630 including garmin.com. However buying directly from the retailer is usually the most expensive if not the most reliable option. We highly recommend buying your Garmin devices directly from the Garmin Amazon store. Here you’ll find a range of prices and bundle options. 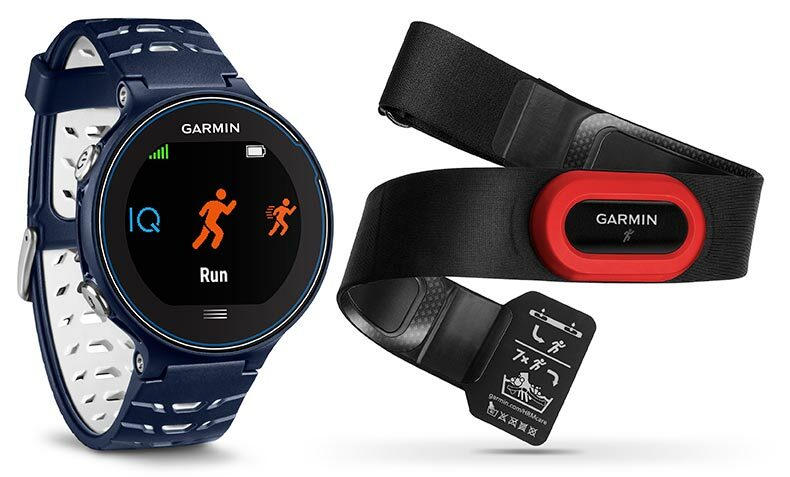 The Forerunner 630 can be purchased either with HRM-Run bundle or without. Although buying without the HRM-Run hardly seems worthwhile as you won’t be able to capture the 2nd generation running dynamics.